The chart below shows downtown St. Pete real estate statistics from March 2016 to May 2017. 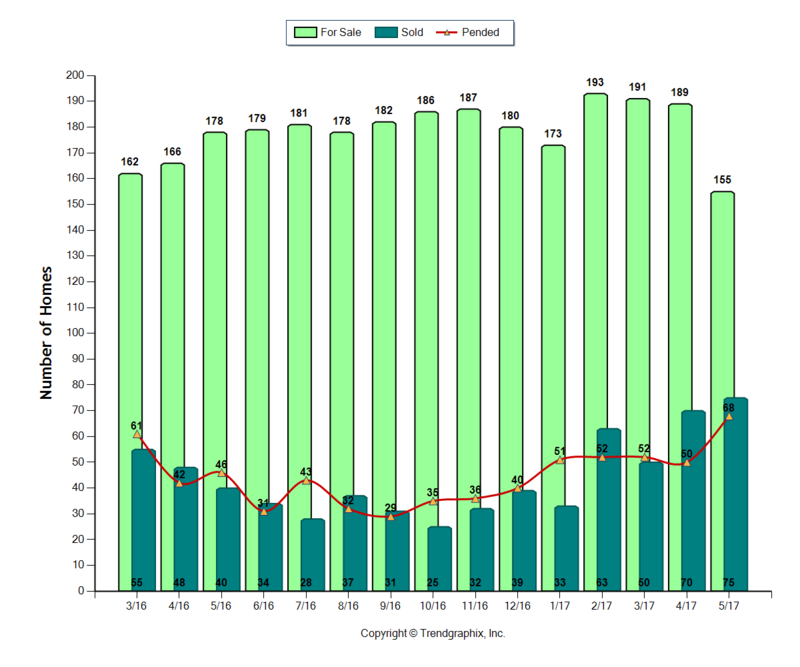 Take a look at how much the inventory of homes and condos for sale in downtown dropped in the month of May. Compared to April, the number of properties for sale in zip code 33701 dropped 18% and is about 13% lower than May of 2016. Sold properties were up 7% when compared to April 2017 and a whopping 87.5% higher than the same month a year ago. The Pended (under contract) properties increased 36% from April 2017 and is 47.8% higher than May of 2016. The Average Sold Price per Square Footage was up 3.9% compared to the previous month and down 1.5% compared to last year. The Median Sold Price increased by 5.6% from last month. The Average Sold Price also increased by 12.4% from last month. Based on the 6 month trend, the Average Sold Price trend is "Neutral" and the Median Sold Price trend is "Neutral". The Average Days on Market showed a neutral trend, an increase of 1.3% compared to the previous year. The ratio of Sold Price vs. Original List Price is 95%, an increase of 1.1% compared to the previous year. These are huge increases in sales and decreases in inventory. Economics 101 says that if supplies decrease and demand stays the same or increases than prices will rise. 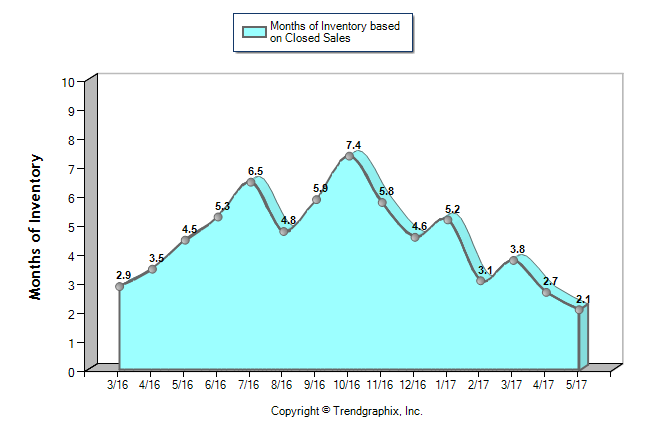 The May 2017 Months of Inventory based on Closed Sales of 2.1 was decreased by 53.9% compared to last year and down 22.2% compared to last month. May 2017 is Seller's market. The May 2017 Months of Inventory based on Pended Sales of 2.3 was decreased by 41.3% compared to last year and down 39.7% compared to last month. May 2017 is Seller's market. Below are all of the downtown St. Pete condo sales in May 2017 (zip code 33701). Examining the sales more closely you will notice that a large portion of the transactions were in The Salvador. This is the new condo community of 74 units located at 199 Dali Blvd. The large percentage increase in condo sales were due to the completiong of The Salvador. Regardless, there is still less supply of properties for sale in the 33701 zip code. Contact us if we can help you buy or sell property in St. Petersburg.